An employee handbook is an internal document in which you state your company’s mission, vision, culture, and legal aspects of employment. It’s a great tool to welcome new employees to your company and let them know the expectations and policies of your workplace. Create your Employee Handbook - It's Free! Your starting point to create and share a comprehensive employee handbook, without any design experience. 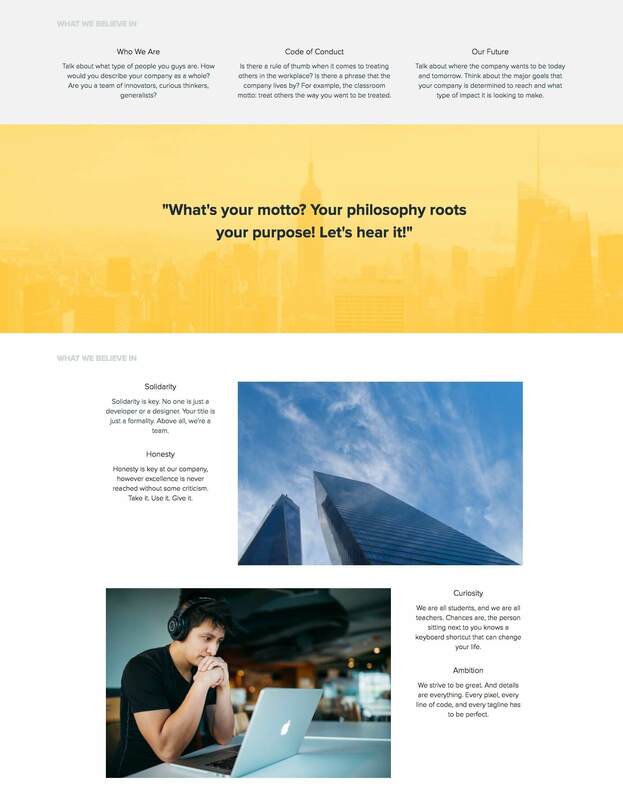 While some of this information may change as your company evolves, the great thing about using Xtensio’s Employee Handbook template is that it becomes an editable living document once you save it to your dashboard. Move modules and sections around to make the template fit your needs and regularly update it as your company grows. Collaborate on it with your HR team and upper management. Then share the live link to your employee handbook with your employees and new hires so they’ll always be able to see the latest version of the handbook – no sending PDFs or updating a web page in the CMS everytime you need to make a change! Employee handbooks vary widely in layout and content based on the company. You’ll need to define what information is necessary to tell your employees and create your handbook to meet your specific needs. The most common and professional way of beginning is by creating a well-organized “Table of Contents” where you list what information is included in the handbook. This will help organize how you want to create your handbook and it will make it easy for readers to find what they’re looking for. 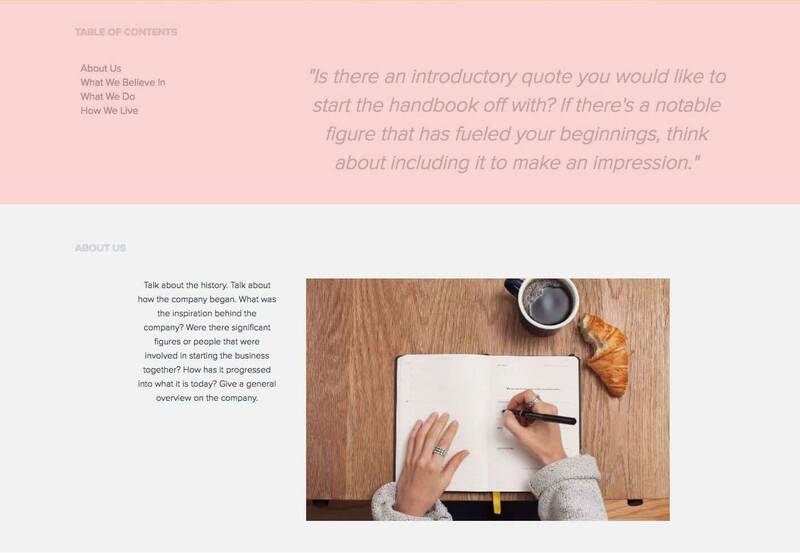 Quick Tip: An awesome way to welcome new employees to the company and add depth and relevance to the handbook is by including an introductory quote. If you have a quote from the CEO or other management figure that reflects your company culture and spirit, this is a great place to use it. The first thing your employee handbook should highlight is who your company is by giving background information. It’s important for employees to know these details so they can have a better understanding of the company’s current status. How did the company start? What’s the story behind the creation of the company? Who were some of the significant figures behind the company’s start? How did the company progress? What is the size of the company (revenue)? How many employees are there currently? How many locations is the company operating in? Bonus: Take advantage of Xtensio’s graph and chart modules to explain how your company has grown since inception, draw a clear timeline of the company’s history or indicate a departmental breakdown. 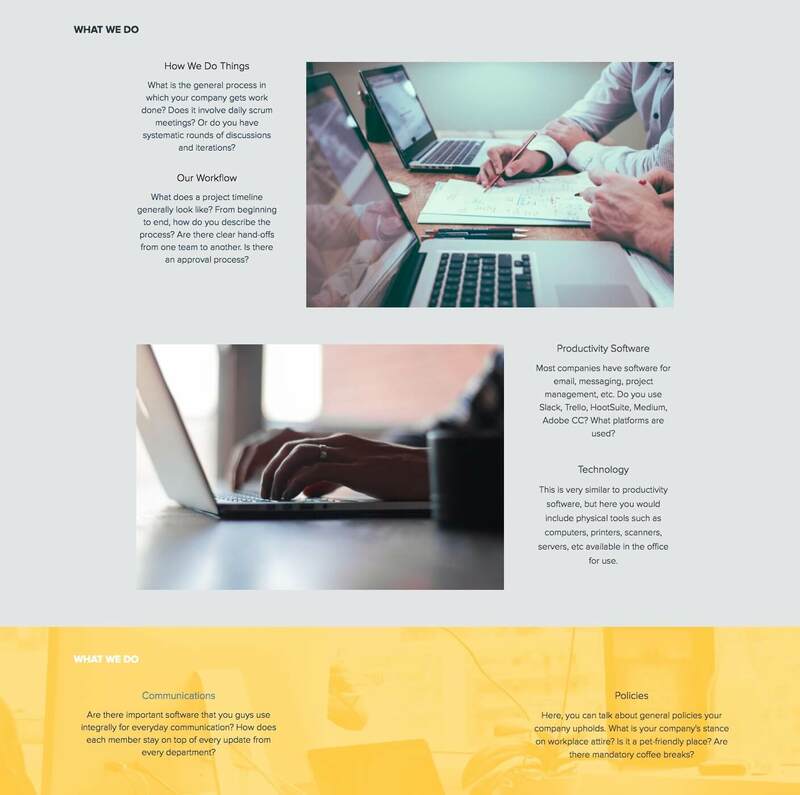 Modules are the building blocks of your folio and can be moved, resized and customized so you can create the layout and look you need. It’s time to dive into your company culture and describe what makes you, “you”. Do you have a company motto? Make sure it has a place in the handbook. Talk about how you would describe your team members and your company as a whole. What are some key values your company sticks to? These values are also the personality traits you look for in your team. Every company has dos and don’ts. What is the rule of thumb in the workplace? Highlighting the company code of conduct is certainly beneficial, both for the company and the employees. You should also outline company work hours and explain employee benefits (health insurance, 401K, etc.). You might have mentioned these policies during the hiring process but they need to be written in your employee handbook so employees can reference this in the future. To close this section, you should outline the company goals and expectations to align everyone with the same vision. What does the company’s future look like? What you believe now will determine the future of your company. Make sure the “now” is clear for everyone. Bonus: It’s important that your employee handbook includes legal information to protect both your employees and company. But it doesn’t mean the employee handbook has to be too long or boring. Get creative. Stay unique. It will help cement your brand identity with your employee and give the handbook a spirit of its own. Some companies nailed it and turned their employee handbooks into a fun read. After outlining your company’s history and values, it’s time to highlight what the company’s work process looks like. What is the general workflow in the company? Do you have scrum or other regular meetings that all employees should be aware of? What are the workplace policies? Is there a dress-code all employees should be following? Is it a pet-friendly workplace? Give details about how employees are expected to behave in the workplace. The fun part! Talk about the perks and benefits of working for your company. Do employees get gym or coffee memberships? Do you have happy hours on Fridays? Do you arrange any activities outside of the company, BBQ parties or retreats? Are there any team building activities organized regularly? Mention them all and get employees excited about working for your company! Another important topic (a question every employee will be thinking of) is about the number of vacation or sick days. Explain details about the paid time off and remote working protocols. Be very clear when explaining these topics to avoid confusion or exploitation. Quick Tip: Finish your employee handbook with a thank you message to all employees and include a contact email address to make sure any related questions are answered by the right person on your HR team. Don’t forget to update your employee handbook! Company policies, work hours, perks and benefits… Everything related to your company and employees will likely change over time. In order to prevent any confusion or issues between management and employees, it is very important to update your employee handbook quickly whenever something changes internally. 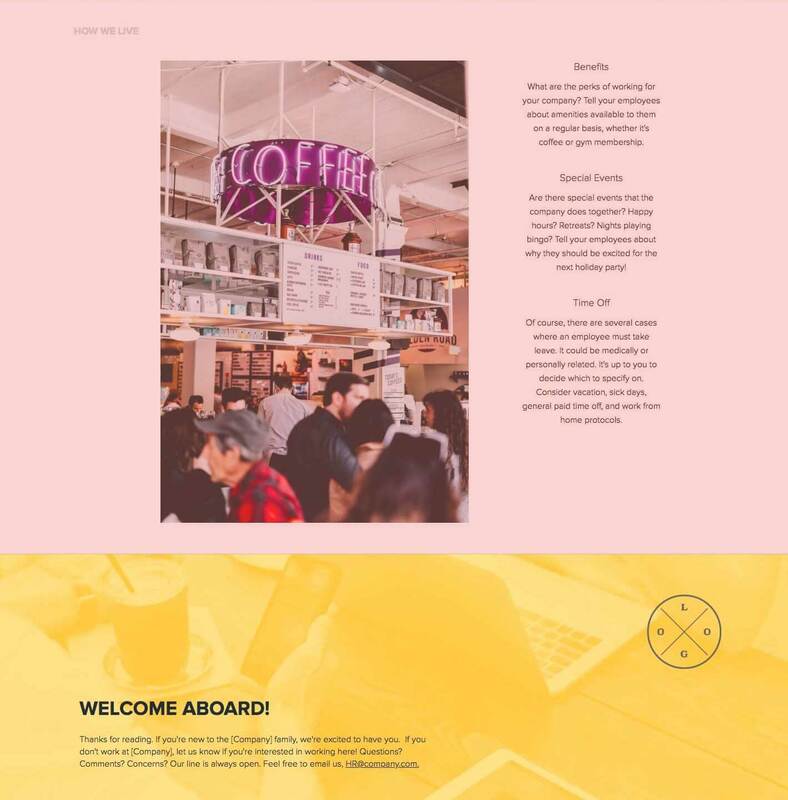 The employee handbook template is adaptable just like other Xtensio tools, it can be repurposed, revisited, and revised to suit your evolving needs. You can always add, delete, and move your modules and sections around with Xtensio’s versatile editor to adapt the employee handbook as you need it. And the great part of sharing the live link to your folio is that all changes will auto-sync across devices so your employees can always be up-to-date without having to resend PDFs or update a page on your website in the CMS.